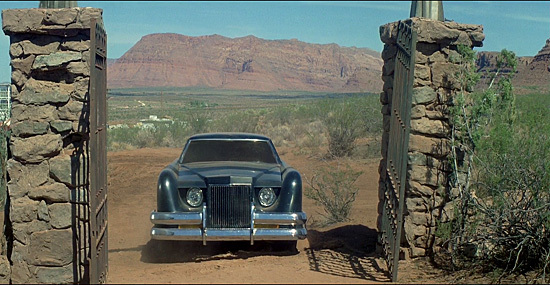 The Car, director Elliot Silverstein’s ‘cult horror’ (and I use both words in their loosest sense), starring James Brolin, Kathleen Lloyd, John Marley and Ronny Cox, is one of those obscure films which many people claim to have heard of, but few have ever seen. Something with four wheels, a high-powered engine and the soul of the devil, is hunting down innocent people on the desolate highways and isolated open spaces of the dusty Utah desert. Terrorized by this limo from Hell the inhabitants of the small town of Santa Ynez, under the leadership of local law man Captain Wade Parent (Brolin), decide to fight back with catastrophic results for those who survive. It would be so convenient to dismiss this banal, would-be chiller as an outright hoax – a hapless attempt to raise goosebumps through a series of pseudo grisly road accidents at the wheels of a sinister, demonic possessed car. At least it would be if the film didn’t have the potential to be, if not good, at least mildly entertaining. One can imagine if the same film was made for the current horror market where, quite literally, anything goes, it might work. There are several places – for instance in the initial opening carnage where two innocent cyclists are disturbingly run off the road – which could have been genuinely horrific (particularly given today’s preoccupation with bicycle related road accidents) had the filmmakers had the ‘guts‘ to take a more visceral approach to the various scenarios. Instead the shock sequences, which come just often enough to hold your attention, are bloodless imitations in a film which overall lacks the courage of its convictions. Visually the film is stunning. Shot on location in Utah, cinematographer Gerald Hirschfeld captures the barren majesty of the state’s deserts to add a sense of dusty sparsity which emphasises the distress and isolation of the car’s victims. However any potential tension is diluted by a script which focuses on long bouts of lackluster interaction between the main characters peppered with inane dialogue. Arrow Video’s Blu-ray release of the film comes with a host of extras including an interview with actor John Rubinstein who plays one of the car’s hapless prey. He claims that The Car is one of those productions of which many of those involved seem to have conveniently forgotten. Watching it you can understand why.